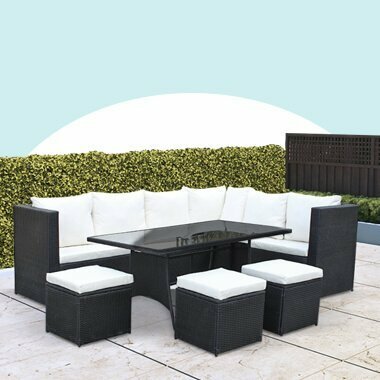 During the long summer months, relaxing in the garden and enjoying the sun is something everyone looks forward to. 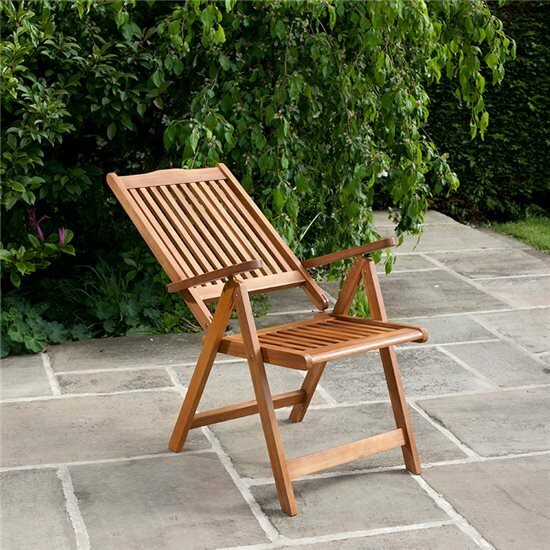 Kick back and enjoy it all with this BillyOh Windsor Reclining Chair. With five reclining positions to choose from, you are sure to spend hours relaxing in style! 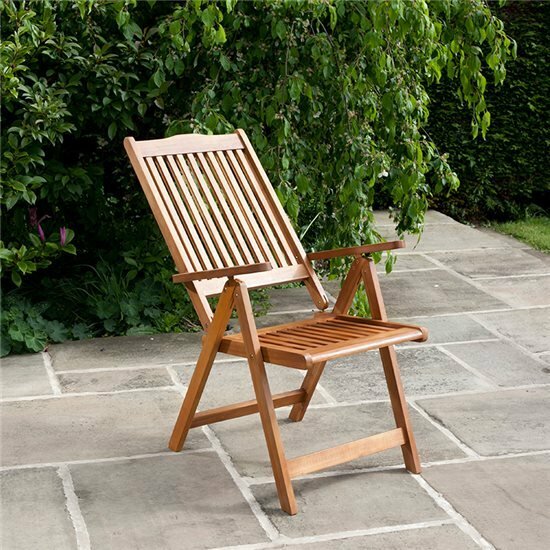 The Windsor Reclining Chair has a look of the traditional garden chair, with a slim-line and modern, slat high-back design. It combines perfectly to complement and enhance the appearance of your garden. And it couldn’t be any simpler to recline. All you have to do is lift the arms and slide the handles forwards or backwards to your choice of one of the five comfortable reclining positions. 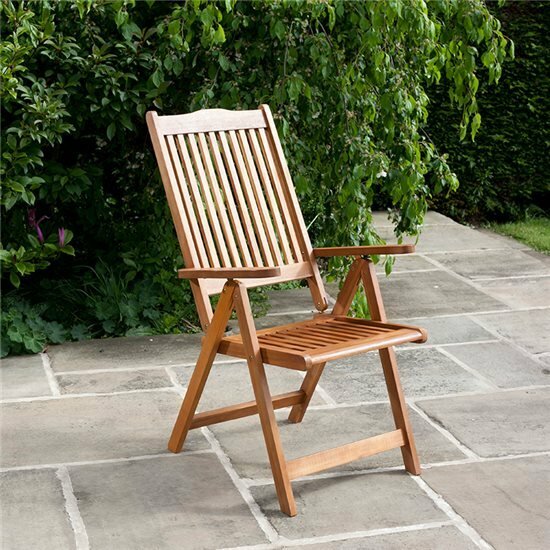 Constructed from a stunning light acacia hardwood, perfect for your outdoor furniture. 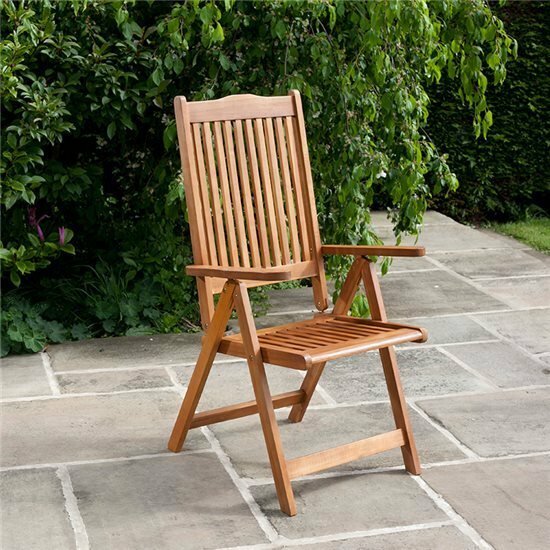 The durable properties of this hardwood mean the chair is suitable for being left outdoors all year round. However, the lightweight design means that it can be simply folded down and stored away while not in use. Whether your new reclining chair is joining an existing furniture set from BillyOh, or if it is a stand-alone piece for your garden, or even sits as part of a pair, you’ll be glad to know that this reclining chair folds down easily for storage and travel. So, if you’re planning a picnic or weekend away you can take your new garden recliner with you, meaning relaxation is now portable. The chair folds down for easy storage and travel. So, if you are planning a picnic or weekend away, you can take your recliners with you. You have the option of adding a comfy seat cushion, available in a range of great colours. Add the perfect finishing touch to your recliner with a soft and comfy cushion. Chair Dimensions 58cm x 110cm x 58cm 1'11" x 3'7" x 1'11" 58cm x 110cm x 58cm 1'11" x 3'7" x 1'11" 58cm x 110cm x 58cm 1'11" x 3'7" x 1'11" 58cm x 110cm x 58cm 1'11" x 3'7" x 1'11" 58cm x 110cm x 58cm 1'11" x 3'7" x 1'11" 58cm x 110cm x 58cm 1'11" x 3'7" x 1'11"
Chair Width 58cm 1'11" 58cm 1'11" 58cm 1'11" 58cm 1'11" 58cm 1'11" 58cm 1'11"
Chair Depth 58cm 1'11" 58cm 1'11" 58cm 1'11" 58cm 1'11" 58cm 1'11" 58cm 1'11"
Chair Height 110cm 3'7" 110cm 3'7" 110cm 3'7" 110cm 3'7" 110cm 3'7" 110cm 3'7"